This is an incredibly easy project to do, and great for those who want to do their own flowers but don’t have any arrangement experience. The whole thing cost me about $25, but I also had access to inexpensive peonies at my local farmer’s market. Pricing this out at a floral wholesaler is advisable – otherwise, it’s easy to replace the peonies with other voluminous flowers like carnations. 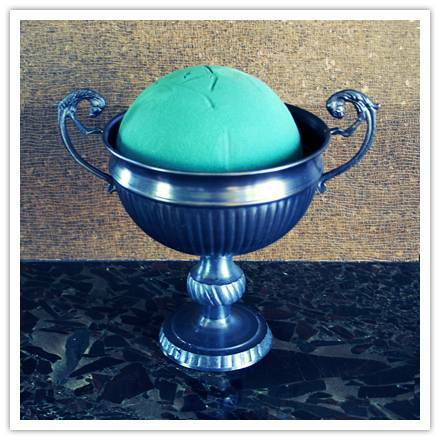 STEP ONE: Thoroughly soak your floral foam sphere – it will absorb more water than you think! Set it in your container as shown above. STEP TWO: Find a flower that’s in good shape. Trim the stem a couple inches short of the diameter of the foam sphere (I cut them to four inches long) – make sure they’re not too short, because you need the length to anchor the flowers into the sphere. Remove all stray greenery from the stem. STEP THREE: Insert the first flower at the top of the foam sphere by gently pushing the stem into the foam until the flower head touches the surface of the sphere. Make sure the hole made is clean and as close to the size of the stem as possible because otherwise the flower won’t stay put! STEP FOUR: Working in a circle around the first peony, continue to add in more cut and cleaned flowers. The further you go down the side, the more important it is to make sure you aren’t making the holes larger than they need to be to avoid anything falling out. 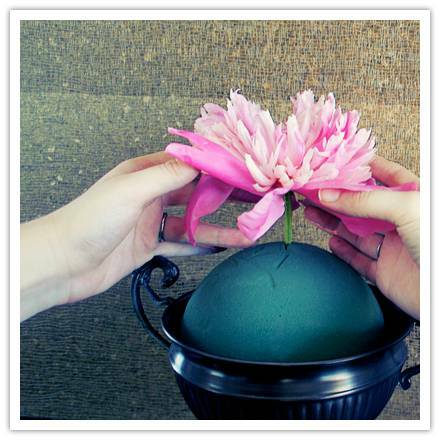 You’ll also want to make sure you’re giving each flower head enough space while not showing any of the green surface of the foam sphere. 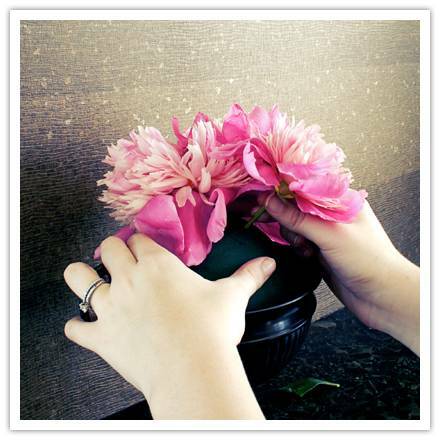 STEP FIVE: As you are working in a circle, stop and turn the urn around to make sure the flowers appear to be balanced – you don’t want a lumpy sphere! Before you know it, you’ll be at the base. 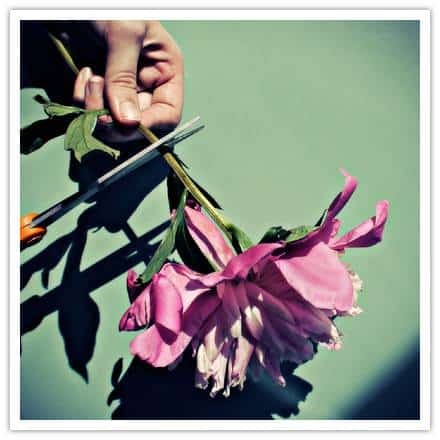 Don’t add any more flowers beyond the lip of the urn – you want the petals to reach over the edge as shown in the final product shot above, but you might start to crush your flowers if you go under it. Congratulations, you have yourself a super-easy centerpiece! 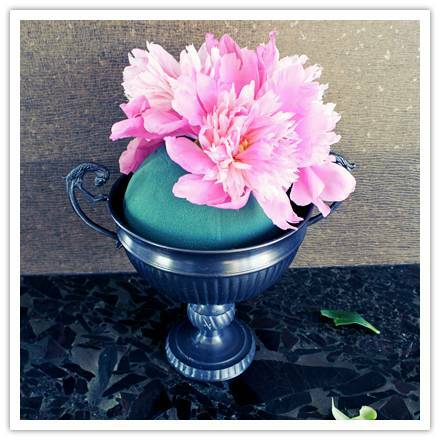 Here’s a few extra tips: if you’re doing this the day before the event, you’ll want to get peonies that are a little more closed than the ones I bought, and you’ll want to ensure you water the foam ball to keep it moist. You’ll want to make them as close to the event as possible. 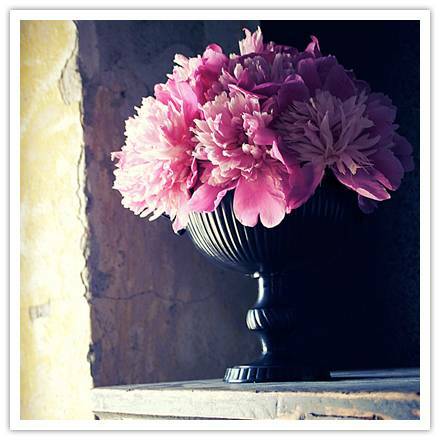 If you’re looking for a good summer-fall alternative, try doing this with dahlias! love this and love the new look! This is beautiful! I’m loving the new look here. I’ll be linking to this. This is so creative, and seems so easy to do! Thanks so much for sharing, I’ll definitely be trying this within the next week! Gorgeous! !